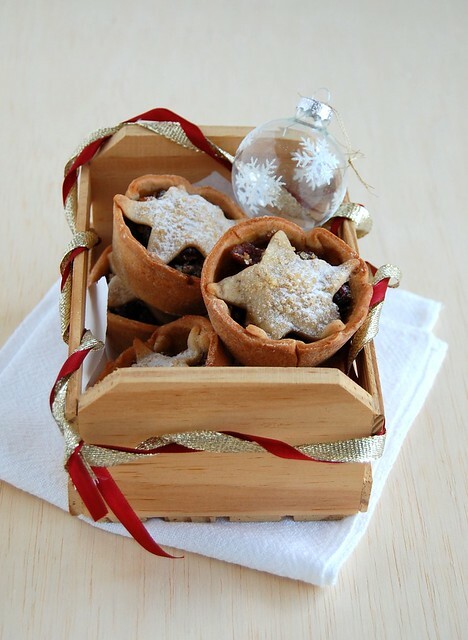 I’d been meaning to make mincemeat pies forever, because I think they look absolutely adorable! But I always gave up at the idea of using suet, or anything similar to it. That is why this recipe is perfect: besides being suet-free, both the pastry and the filling are delicious, with a not-very-Christmas-but-yummy hint of chocolate. Combine all ingredients except chocolate and demerara sugar in a large bowl, stir to combine, then spoon into sterilized jars* and refrigerate for at least 1 day or up to 2 weeks, inverting jar occasionally. Makes about 5 cups of fruit mince. For cinnamon pastry, beat butter, sugar and cinnamon in an electric mixer until creamy, but not fluffy (4-5 minutes). Add eggs one at a time and beat until well combined. Beat in flour and salt, turn onto a lightly floured surface and knead lightly until just smooth (at this point I needed to add 1 ½ tablespoons of flour because the dough was too soft), then divide pastry in half, wrap each half in plastic wrap and refrigerate for 3 hours to rest. Roll out each pastry half on a lightly floured surface to 3mm thick, cut out 11cm-diameter rounds with a pastry cutter, place on a tray and refrigerate until required. Cut out small stars or other decorative shapes from the pastry scraps, place on a tray lined with baking paper and refrigerate until required. Re-roll any remaining scraps to 3mm thick, refrigerate until firm (30 minutes), then cut out more rounds and decorative shapes with small biscuit cutters and add shapes to tray. Preheat oven to 180°C/350°F; butter twenty four ½ cup (120ml) capacity muffin pans. Line the pans with the pastry rounds and refrigerate until required. Add chocolate to fruit mince mixture, stir to combine. Spoon fruit mince mixture into each pastry-lined pan, leaving a 5mm gap at top. Top each with a pastry shape, brush lightly with water, scatter with demerara sugar and bake until pastry is golden and crisp (12-15 minutes). Cool completely in pans, then remove. 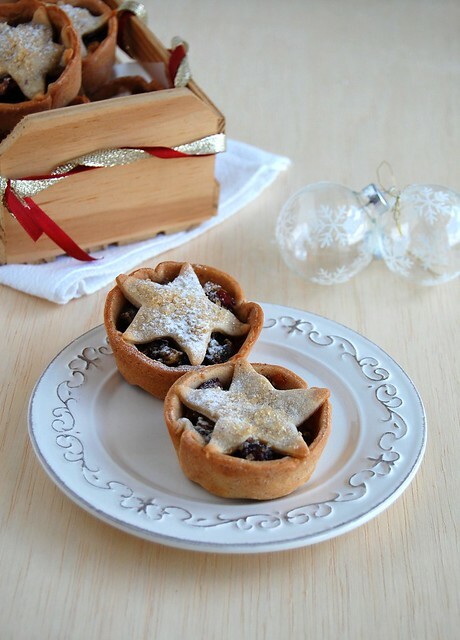 Fruit mince tarts will keep stored in an airtight container for up to 1 week. Too cute to eat, as usual! Love the idea of individual serving tarts. It is very appealing with the star on top. I love how festive these tarts look and that, flavor-wise, they seem to have something for everyone. Thanks for the delicious recipe - I can't wait to try these! mince is my favorite!!! I love the addition of CHOCOLATE! So cute, Patricia. Can't believe I've never tasted mincemeat before. What was I waiting for? Probably a version as tempting as this. These are cooked to absolute perfection. They could be sold in a bakery or café! Just..wow.